This complete beginners guide to painting watercolour street scenes is ideal if you want to learn to paint but are short on time. 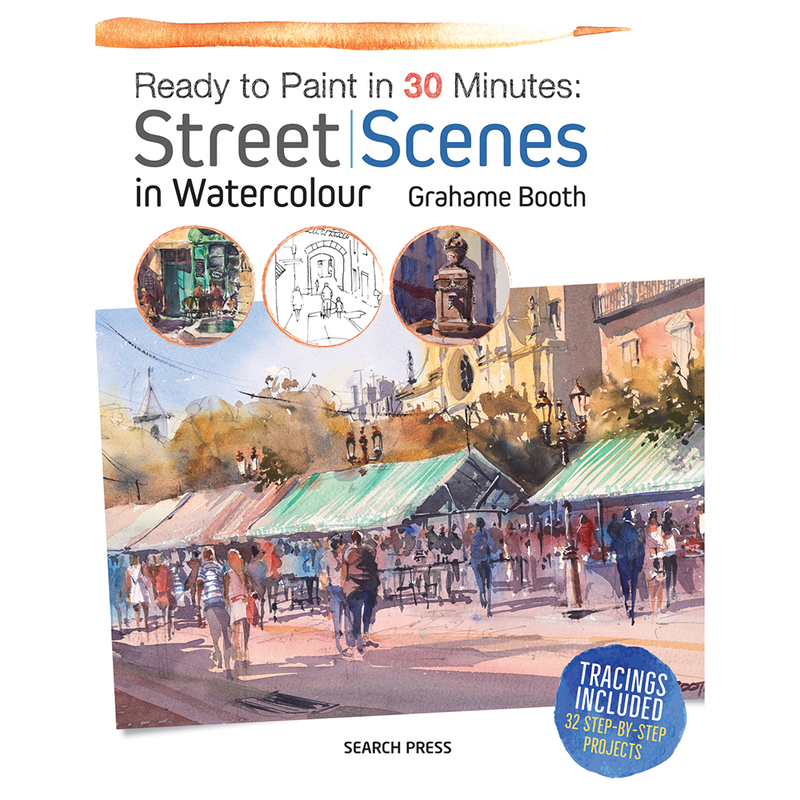 Each of the 32 quick and easy exercises takes no more than 30 minutes and will teach you how to create a new street scene element such as doorways, buildings and people or work an exciting technique such as creating washes, mixing colours and playing with perspective. The exercises are all worked at postcard size ideal for a 6 x 4in (A6) watercolour pad, and actual-size tracings are included. The book is broken down into eight chapters: tone, colour, perspective, the wash, edge control, brush strokes, adding detail and, finally, putting it all together this last section contains 3 finished paintings that demonstrate how to integrate a combination of the elements into vibrant and inspiring street scenes; these complete paintings also have an accompanying actual-size tracing. Painting exclusively in watercolour, Grahame Booth tutors workshops and holiday courses in Ireland and abroad. He is a popular demonstrator for art clubs and his success is reflected in many national and international awards. His work is featured in books, videos and art magazines, including Artist and Illustrators. Grahame is a member of the SAA and is based in Belfast, Northern Ireland. His work is represented in private and public collections including Belfast City Council, Ulster Independent Clinic and the Office of the Mayor of Annapolis, Maryland. He is Past President of the Ulster Watercolour Society. Grahame's work is in a relatively loose, traditional style. His subject range is international, and his use of colour, light and shadow are particularly impressive. The original Ready to Paint series sold well to more experienced artists who might have been expected to dismiss it as 'jumped up painting by numbers'. A complete re-think has produced this development which is a whole new departure. In place of complete paintings there are 30-odd half-hour exercises that concentrate on a single element -skies, shadows, trees, rosebuds, seed heads or leaves. There is also more emphasis on technique and therefore on the learning process. It's definitely worth a look. Ready to Paint in 30 Minutes is a brand new series from Search Press aimed specifically at the complete beginner. The focus is to provide quick and easy instruction for anyone short on time, as each exercise is designed to take no more than 30 minutes. The series kicks off with two titles - Street Scenes by Grahame Booth and Flowers in Watercolour by Ann Mortimer. Street Scenes is broken down into eight chapters covering tone, colour, perspective, the wash. edge control, brush strokes, adding details and putting it all togethe. There are 32 easy exercises for you to work on, each of which covers an element of street scenes, such as doorways or people. The time is limited to 20 minutes spent on each and the size is limited to postcard size, which make them ideal for an A6 watercolour pad. Three finished paintings are demonstrated at the end of the book and are accompanied by actual size tracings to make it easier for the complete novice to get started with their painting. Ann Mortimer will be well known to Leisure Painter readers and in her 30 minute book she covers five main aspects of painting flowers in watercolour: working with watercolour, watercolour techniques, colour and tone, form and details, and finally, flowers in context. Once again the size and time is limited for each exercise and the final section, also accompanied by actual size tracings, demonstrates three paintings that combine all the techniques learnt. This is genuinely exciting evolution of a popular series. You'll be guided through some simple exercises and on to complete painting, gaining valuable insights that will develop and improve your skills.